Adams said he does not think the Taoiseach has “good instincts” when it comes to dealing with these issues. Gerry Adams speaking at the Teacher's Club in Dublin today ahead of the party's think-in. SINN FÉIN LEADER Gerry Adams said he does not think the instability of the Northern Assembly is a threat to the peace process. Time will be called on Northern Ireland’s power-sharing government at 5pm as no deal has been reached between the DUP and Sinn Féin. Sinn Féin has declined to re-nominate a Deputy First Minister in Stormont following the resignation of Martin McGuinness last week – meaning a snap election is now on the cards. Speaking to reporters ahead of the party’s think-in in Dublin, Adams said he is not concerned that the controversy will threaten the peace process. Adams also criticised Taoiseach Enda Kenny in relation to the imminent dissolution of the Assembly. I don’t think the Taoiseach has a good instinct on these issues. I think he values the peace process, he obviously appreciates the work that has been done and wants that to continue – but the work that was done wasn’t done easily and it wasn’t done with grand speeches. It was done by really, really hard work by dedicated people from all sides and that’s what the Taoiseach has to do. Adams said the Kenny is constitutionally bound as Taoiseach to deal with the issues at play in the north. 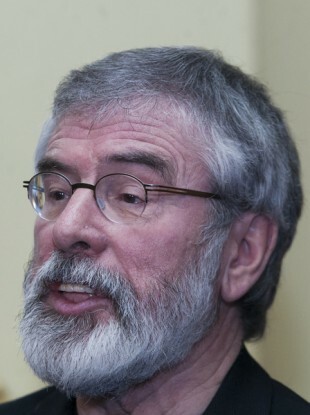 Under the terms of the Good Friday Agreement, Adams said it is the responsibility of both the British and Irish governments to ensure there is equality. “It doesn’t even rest with the administration in Stormont,” he added. Even if I put this in the kindest way possible, there is a huge onus on the Taoiseach to fulfill the responsibilities for all the people on this island in terms of an international treaty, an international agreement of which he is a co-guarantor. “There is an onus on the Taoiseach to deal with this issue, I have argued with him and debated this privately and publicly and I have tried to do it in a considered way. Adams said it all well and good for the Taoiseach to make telephone calls “in the early hours of the morning” to the Principal Private Secretary to the UK Prime Minister when there is a crisis, but he said hard graft needed to be put in also. “These problems we have been flagging for a long time. What is required is consistency, is strategic and ongoing engagement with the British government and our friends internationally to ensure the British government upholds its obligations. “The British government refuses, refuses, to put the mechanisms in place to deal with legacy issues that were agreed at Stormont House two years ago – refuses to do it. What does the Irish government choose to do about it? That’s the big question. There is no point lip servicing it – it needs diplomatic outreach,” said Adams. The Sinn Féin leader put equal blame on the British government for the current state of affairs. I am not surprised by the British government, because the British government will always act in what is its own self-interest and it is very good at doing that - and that doesn’t include the north. The Brexit decision was taken without any contemplation for the people in the north. Adams continued by saying that the Irish government has not called on the British government to take heed of the issues at play. He said Sinn Féin is going forward “confident” in its resolve to be back in the institutions – but said the basis of that has to be the Good Friday Agreement. The same question was posed to Pearse Doherty. I represent the most northern part of Ireland and I am very content to do so. Email “Gerry Adams says Stormont collapse is not a threat to the peace process ”. Feedback on “Gerry Adams says Stormont collapse is not a threat to the peace process ”.